The big ole state of Texas is actually one of the most rapidly developing start up states in the nation. Trust me, after founding Nibletz.com and the everywhere else conference I know a little bit about startup communities. Dallas, Austin, San Antonio and Houston have rapidly growing startup communities and all have some kind of startup hub. Denton Texas, a city a little bit north of Dallas, also has a startup community but no real centralized hub. 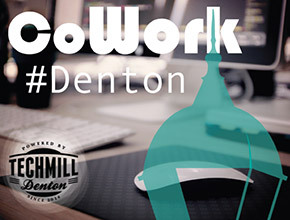 They have a hardworking group of startup and creative community members that make up TechMill Denton who are spearheading the effort to build a new hub and co-working space. Organizations are great and Techmill is definitely one of them. They’ve hosted several events including Open/Hack Denton, LittleDOCC, Denton Jelly and Denton Startup Weekend. They’re also heading up a conference for bootstrapping startups called BootConf in April 2015. Now, they use borrowed space from other members of the community and supporters but they really want a space of their own. The founding team of Marshall Culpepper, Dave Sims, Kyle Taylor, Clarissa Redwine, Daniel Abasolo and Tyler Browder have done an amazing job sparking the creative, startup and hacker community in Denton without a permanent address, imagine what they can do with one. That’s why they’ve taken to Indiegogo to raise money for CoWork Denton. Like many coworking spaces there will be desks, offices and places to work. Like many startup focused coworking spaces there will also be events, workshops and resources. TechMill is attracting startups, founders, coders, hackers, creatives and anyone who wants to be part of the community to participate in building the space. They’re looking for a modest $22,000 which they’ll use towards the first few months of rent, acquiring some furniture and setting some aside for emergencies and rainy days. What’s really innovative about their space is that they plan on running it as a co-op so the number of members will dictate the monthly rent. The more members the less each member will pay. Think of it like a grocery co-op but for coworking space. This model will insure members invite new members and that they take an even more vested interest in the community and the space. I know you’re like ok let me give them some money now, so here go fund them on Indiegogo and to learn more about TechMill here.